Rarely does one historical event have such an impact. The Long March of 1935 can be compared with the Dunkirk evacuation ➚ and the Cuban Missile Crisis ➚. The after effects reverberated on for 50 years and shaped China's position in the world. Although historians can agree on its importance, there the unanimity ends, the facts of the Long March continue to be hotly debated. By dogged determination and sheer good luck the Communists escaped their doom, surrounded and outnumbered at the Jiangxi Soviet to arrive at Shaanxi as war-hardened leaders to drive forward Communist Party policy for fifty years. The veterans of the Long March held the reins of power for the rest of their lifetimes. They gave an outward show of solidarity and unity which bestowed China with much needed stability and a springboard for rapid economic development. Shared hardship forged bonds of loyalty and understanding. Just as importantly Mao Zedong emerged from the Long March as a wily and effective leader who went on to lead the party and then the country for 35 years without much opposition. Although unintentional, it did turn out to be a very Long March, covering the distance of New York to San Francisco – and back 6,000 miles [9,656 kms] in just one year. The events of the Long March became such a potent symbol of Communist Chinese determination that no-one was permitted to question its achievements. The spirit of the Long March was for many years used to urge people to greater effort, to honor their sacrifice. Any suggestion that the Long Marchers fell short of heroism was regarded as deeply unpatriotic; making it hard to uncover the true facts. At times some of the marchers did not live up to the high ideals, and some events were over-dramatized for propaganda purposes. However even if the achievements Long March were not as impressive as has been claimed the symbolic power has been just as important. The annihilation campaigns of the early 1930s led by Chiang Kaishek of the Guomindang (GMD) /Kuomintang (KMT) were the reason for the Long March. His view was that the Communists were terrorists and deserved no mercy, they were not ‘honorable’ opponents. His decision to exterminate rather than capture them and put them on trial certainly added to Communist determination, it was a life and death struggle. In October 1930, a GMD commander He Jian captured Mao's wife Yang Kaihui and their son Mao Anying. Mao Anying was forced to watch the torture and execution of his mother; Zhu De's first wife Wu Ruolin was arrested and executed - such was the brutality of the GMD. A massacre in Shanghai on 12th April 1927 of about 5,000 unsuspecting Communists (the 'White Terror ➚') is one of the worst atrocities of the campaign. Their inspiration came from previous ‘peasant’ led campaigns in Chinese history. Zhe De as a boy, heard of the efforts of the Taiping rebels to bring reform and learned about their military strategy 共产党 gòng chǎn dǎng. In the 1920s the ‘poor peasants’ represented 80% of rural population had been crushed by ruinous rent and interest rates from landlords and the Jiangxi soviet had tapped into a groundswell of grassroots anger at such exploitation. Their enemies the Nationalists or GMD were also republicans, and many Communists had served under them, including Zhu De and Zhou Enlai. However their vision was focused on industrial development in the cities not bringing relief to the majority who toiled in the fields. Chiang Kaishek had emerged from Sun Yatsen's shadow as the strongman who would, by force, unite and modernize China. The GMD strategy was to encircle and then close in on their opponents. After repulsing four major campaigns, the fifth launched in September 1933 under German and Russian guidance built block-houses that could withstand guerrilla attack and offer safe fallback positions from counter-attack. About 900,000 GMD soldiers hemmed in about 100,000 Communists. The Communists decided that their position was untenable and they must break-out or be killed. The Communists had no idea that the March to the West would become an epic Long March. Their options were always dictated by limited opportunities whenever they arose. 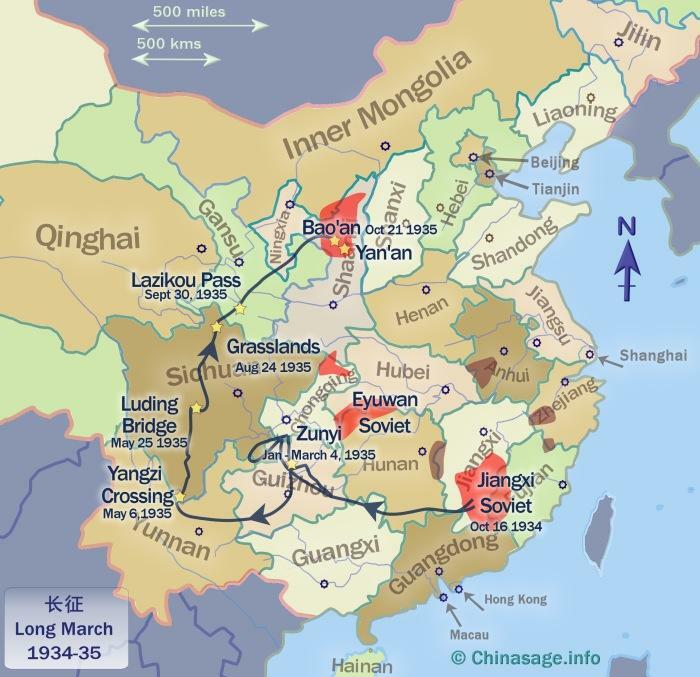 The Western portion of the GMD's encirclement was judged weakest and so on 16th October 1934 they broke out towards Guizhou with the aim of turning north to join a Soviet in North-west Hunan. 6,000 troops were left behind at Jiangxi to disguise the break-out, it took a vital few weeks before the GMD worked out that most had left. The remnant fought a desperate rearguard effort. 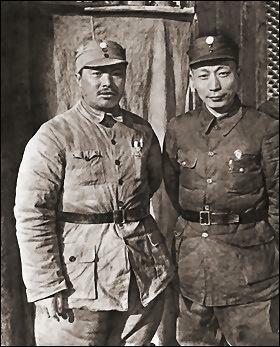 Mao Zedong's own brother Mao Zetan was one who stayed behind and was captured and executed on April 25th 1935. The route of the Long March 1934-35. Dates are approximate as the army took many days to pass a single point. Areas of Communist control are shown in red, dark red for areas 'cleared' by the GMD prior to the Long March. The March was immensely grueling, often covering 17 miles [27 kms] each day on foot, day after day through mountainous terrain and severe weather. Many marches were at night to avoid enemy detection and aerial bombing. On average they took one day's rest for every 114 miles [183 kms] covered. Some of the leaders traveled on horseback except for the steepest terrain. Some of the sick, including Mao who suffered from malaria, was carried by stretcher at least part of the way. The very sick were left behind in the care of the villagers. Only one fully Western trained doctor accompanied them. Most of the wives and children were left behind but some of the wives of the leaders were the exception including Mao's He Zizhen ➚ and Zhu De's Kang Keqing ➚. Some boy soldiers as young as 11 took part. It is estimated 53% were aged 16-23; 44% 24-40; and only 4% over 40 years old. Only about a quarter were actually members of the Communist party. Discipline was strict, soldiers were sometimes executed for disobeying orders. Soldiers could not steal from the locals, who they relied on for their welfare and defense. Many non-combatants traveled with the soldiers; they needed to take everything with them so the entourage included tailors; cobblers; printers; doctors; gunsmiths etc.. They carried substantial amounts of gold and silver to pay for supplies along the way. Initially they carried heavy equipment including printing presses, but these were soon abandoned as they were impractical to carry over the mountains. The non-military and the leaders usually traveled in the central portion protected on all sides by military units. The total numbers involved in the March are hard to tie down as many left and many joined along the way. About 60,000 set out together with 20,000 non-combatants and only about 7,000 reached Shaanxi. Part of the Communist effort was to spread support, so leaving people behind to organize local resistance was part of the plan. They covered about 6,000 miles [9,656 kms] through remote Western China and lost many men to the weather and terrain. The crossing of the Xiang River costs many lives, how many is open to debate some say up to 50,000 in 5 days, the then Comintern ➚ leader Otto Braun ➚ took the blame for this debacle. Under Mao's leadership the army took efforts to keep the rural peasants on their side. Each soldier was inculcated with the eight rules: 1) Speak politely and help people whenever you can; 2) Return doors and straw matting to their owners [doors were used as beds]; 3) Pay for any damage caused; 4) Pay a fair price for all goods; 5) Be sanitary; build a latrine away from houses; 6) Don't take liberties with the women; 7) Don't ill-treat prisoners; 8) Don't damage the crops. The Army seemed to have generally kept to these principles but in areas where the locals were entirely hostile then they did whatever was needed to survive. A pivotal moment came when the 1st Front Army reached Zunyi, in northern Guizhou. For once the GMD were not in hot pursuit and the leadership reflected upon their position and tactics. 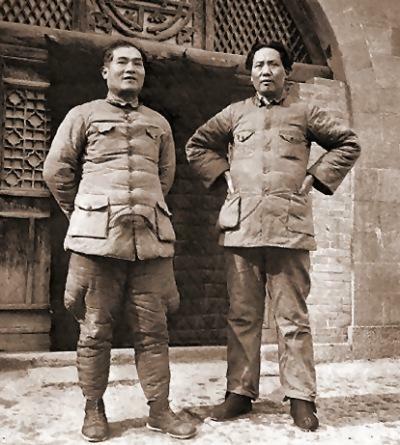 Here on 6th Jan 1935 Mao was given military leadership of the Long March, some say ➚ he also took leadership of the whole Chinese Communist Party (CCP). It seems Mao later used this event to legitimize his control of the Communist Party against the claims of rivals. This seems a shrewd political re-writing of events, it is most unlikely that he was given such a command as only a few of the CCP leadership were present. Up until then they were led by the strategy of Russian advisers and Russian trained officers such as Wang Ming ➚. 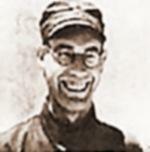 Mao's guerrilla tactics at Jiangxi had proven far more successful than the urban revolutions advocated by Otto Braun ➚ (known by Chinese name Li De). The meeting rejected the Russian advice and backed Mao's leadership. Their initial plan was to join up with a Soviet in Sichuan, but GMD forces held all the crossings over the Yangzi, and the GMD expected them to make for the crossing at Chongqing. So they were forced to break out West into Yunnan to cross the river there and take the long route through mountains into northern Sichuan. It was on this trek that the Long Marchers met their hardest challenges. They had to take the heavily defended crossings of the Yangzi and Dadu rivers. In Yunnan, where the Yangzi is called the Jinsha ‘The River of Golden Sands’ they made a brave crossing at Jiaopingdu 皎平渡 taking ten days non-stop for everyone to cross in a handful of small boats. After crossing into Sichuan they came under attack from the local non-Han Chinese tribes particularly the Yi ('Lolo') people and they were subject to skirmishes with them. The tribes had suffered badly at the hands of GMD and viewed all Han Chinese as enemies. A key factor that gave the Communists the edge during the march was the use of radio communications. Intercepting GMD communications enabled the group to remain one crucial step ahead of their GMD pursuers. The taking of the Luding bridge at Dadu has been portrayed as the most heroic event of the Long March. It was not actually quite so difficult as was described but even so it was another occasion when the GMD thought they had the Red Army trapped and GMD victory inevitable. It was here that a Taiping Army had been blocked at the river crossing and annihilated 70 years previously. Good luck played its part, one stick of dynamite could have brought down the bridge and trapped the Communists. However the locals did not want to lose their precious bridge and instead they just removed some of the planking, believing that would prove an adequate defense. It was not, the Communists crawled over the chains that hung precariously over the surging water; even though under heavy gunfire they managed to take control of the crossing. On many occasions the local warlords who ruled Western China although technically loyal to GMD often made a more selfish calculation; if they attacked the Communists they risked weakening their own forces which were vital to the warlord's power, and so the attacks ordered by the GMD on the Long Marchers were often half-hearted. The Communists exploited the rivalries within the GMD controlled areas to choose a route through the territory of the least 'loyal' warlord. Mao's tactical genius mis-directed the GMD on many occasions, with a series of feints and apparent about turns he successfully hid his intended strategy leaving Chiang Kaishek continually wrong-footed. Many men were lost crossing the snow covered mountains of Sichuan, a high proportion of the followers were southerners unused to the bitter cold of the Great Snow Mountain 夹金山 which rises to 13,497 feet [4,114 meters]. Many had just straw shoes for footwear. This was one area where they were hindered rather than aided by the local tribes. Starvation and fatigue took many victims. When they met up with the 4th Route Army they discovered that Zhang Guotao ➚ had been forced out of their Soviet area in Sichuan by the GMD. Zhang had a much larger army (40,000 compared to Mao's 10,000) and it seems he would not accept Mao's overall leadership and what should have been a great celebration turned decidedly chilly. Zhang's style of leadership was much closer to the GMD model, he seemed to Mao's group an opportunist warlord in the making. His army had not been subject to the same horrors as the 1st Route Army. A break in contact with Comintern's leadership in Moscow allowed the rivalry for leadership to continue between him and Mao; agreements were made only to be immediately broken. 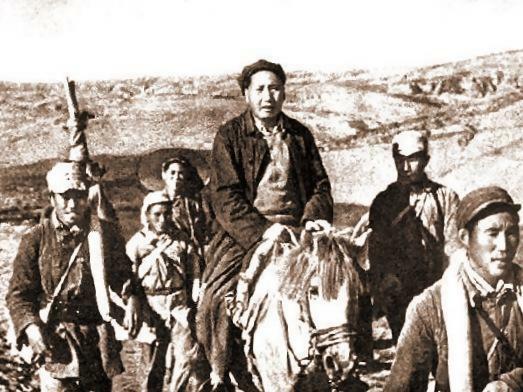 Mao led his much reduced 1st Route Army with some 4th Route Army personnel north to Shaanxi while Zhang took a route towards Chengdu and then further west in Qinghai refusing Mao's orders to move north. Zhu De was apparently held against his will as hostage by Zhang although the truth of this is disputed. The marshy grasslands of north-eastern Sichuan took a heavy toll of few who had so far survived the march. Mao describes it as his darkest hour, there was no food or clean water and the marsh was treacherous, despite being August, the nights were cold with snow and the wretched soldiers had to sleep squatting on grassy tussocks as there were no trees, no dry land, no firewood. The soldiers that did not starve to death took desperate measures to find sustenance. The local Tibetan tribes had fled leaving nothing of value behind. Some say that the PRC took revenge for their ill treatment when Tibet was overrun in 1951. As many died in the grasslands as on the high mountains. Zhang's column of troops turned back finding it too arduous a passage. 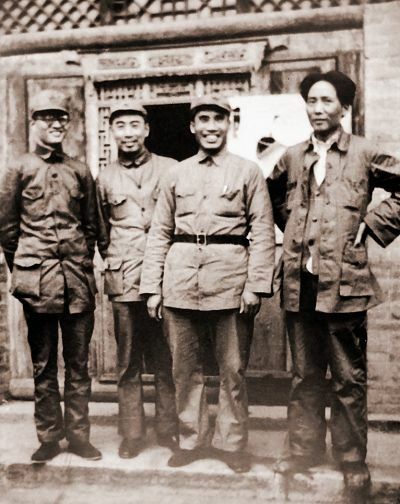 Zhou Enlai and others decided to break away from Zhang to rejoin Mao. The First and Fourth Route armies went their separate ways. What turned out to be the last major hurdle was the Lazikou Pass on the Bailongjiang (White Dragon River) in NE Sichuan where a narrow defile between cliffs barred access to the north-east. It was heavily defended by the GMD and a frontal assault did not succeed. Once again Mao chose a daring strategy to take an apparently impregnable river valley. He sent climbers up the steep cliff at night to bypass the defenses and take the defenders by surprise. The remaining lean and hardened stragglers at last reached one of the very few Communist controlled areas - Zhidan (aka Bao'an) in northern Shaanxi. It was a good strategic base far away from GMD and later Japanese forces. It was much closer to overland routes to the USSR from where they could receive much needed supplies. The friable loess soil allowed them to easily build caves offering secure cover from air raids. Shaanxi had been ravaged by famine in the 1920s when as many as 3 million had starved to death. It proved fertile ground for the Communist message of the reform of land ownership. An important historical perspective is that for hundreds of years revolution took place in southern China, not the north, this may have been a decisive factor in the years that followed. Certainly it helped the Communists take Manchuria when Japan was defeated. 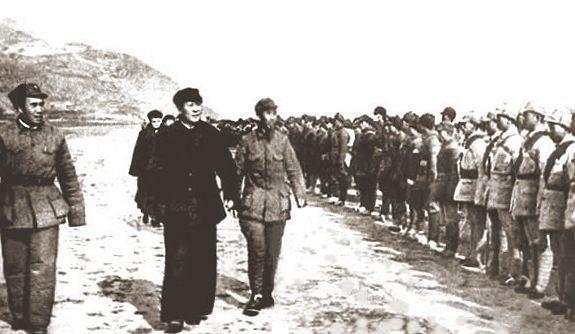 Here they were joined by another Red Army completing their own Long March, the 2nd Front Army led by He Long ➚ 贺龙 had set off from Hunan in November 1935, by June 1936 it met and joined Zhang's army. They took a more westerly route through Yunnan traveling through Lijiang. Their trials and tribulations have not been recorded in anything like the level of detail as Mao's group. In December 1936, the Communist H.Q. moved to Yan'an. In a coincidence of Chinese history that would not have been lost on the CCP leadership it was at a village near Yan'an that Li Zicheng was born, he was a rebel leader who brought down the Ming dynasty in 1644. Here Mao developed policies that centered on self-criticism and self-improvement that were imposed rigorously; some were adapted from those of the Taiping Rebels. Zhou Enlai was one among many who were forced to openly proclaim their mistakes. Decisions were made democratically and there was gender equality. Land reform was initially limited to capping rents rather than redistributing land ownership. Then the leadership threat to Mao of Zhang Guotao ➚ was conveniently removed when Zhang led an ill-planned campaign into Xinjiang to be wiped out by GMD backed Muslim warlords. The threat of a new GMD encirclement and annihilation campaign of the Shaanxi Soviet was called off only because of the invasion of the Japanese in 1937. At this time the GMD must have thought they had the victory, the Communist bases in southern China had been wiped out; the Communist party was restricted to a few small rural areas in the far north; and the size of the Communist party was at its lowest ebb of 40,000 members. The story of the Communists after the Long March demonstrates how a small but focused force can take on a larger and better equipped enemy. The legacy of the Long March was immense in many ways: the leadership role of the People's Liberation Army (PLA) was foremost - the heroism and dedication of the Army led to the belief that ‘impossible’ projects could be achieved; Mao's leadership position went without serious challenge for the next forty years and it represented an all-Chinese modern achievement unifying the people. Discipline and loyalty within the PLA allowed sweeping reforms to be introduced quickly and efficiently bypassing the stalling tactics of the centuries old civil service. Mao's guerrilla tactics were applied to the country as a whole - take the unexpected way to achieve the inconceivable - for example the Great Leap Forward. He continued to rely more on ordinary peasants than the intellectual elite that he deeply distrusted. Mao's unchallenged grip on power was immense, it is a rare event in world politics to see such long term leadership. Although Zhu De took a back seat after 1949 the other Long March leaders were given key positions in the PRC; including Zhou Enlai, Lin Biao, Deng Xiaoping, Liu Shaoqi and Peng Dehuai. However their comradeship and sacrifice did not save them from the madness of the Cultural Revolution 1966-75, Liu Shaoqi, He Long, Peng Dehuai were all tortured and killed, even Zhou and Deng were under house arrest and narrowly escaped death. In late 1966 at the start of the Cultural Revolution many teenage Red Guards recreated the Long March as the ‘New Long March ➚’ is a show of solidarity with the sufferings of the original Long Marchers. 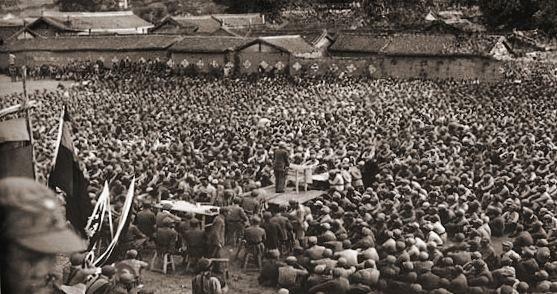 Groups from all over China converged on the Jiangxi Soviet area forming mass camps. Unfortunately an outbreak of meningitis caused the authorities to break up the camps and send the youngsters (some only twelve years old) back home. At the Jiangxi Soviet and during the Long March the leadership and tactics of the Russian trained advisers came under scrutiny. The Chinese Communist leadership took the decisive step of developing their own Chinese ideas breaking free of Comintern control. The rivalry of China and Russia proved immensely influential in the years that followed. What emerged was a rural based revolution, with a distrust of all that is urban, ancient and foreign; the Long Marchers were not great international travelers, both Mao and Lin Biao had only been briefly visited one foreign country - Russia. During the Long March the leadership learned at first hand the antipathy of minority people at the fringes of China, it became a priority to bring them into the Han Chinese world. The survivors of the Long March had learned that group effort was essential, personal ambitions and differences were put aside when the greater good demanded it. It set the tone for much of the next phase of Chinese history. Citation information for this page : Chinasage, 'The Long March - China's epic journey 1934-35', last updated 5 Dec 2016, Web, http://www.chinasage.info/longmarch.htm.